Events on campus will raise awareness and celebrate environmental topics of interest. Emory Photo/Video. Earth Day is celebrated around the world on April 22. 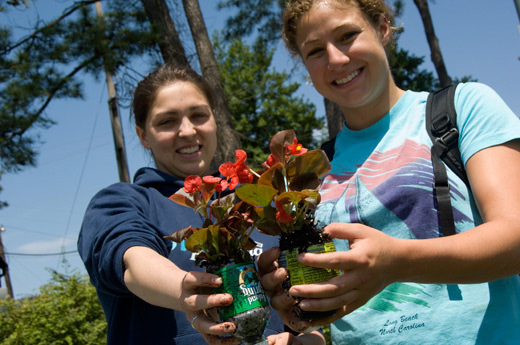 For many years, Emory's observance has spilled beyond Earth Day to include numerous activities throughout a month-long celebration on campus and in the surrounding community. These events help to raise awareness and educate the Emory community about the environment and share practical ways to preserve it. This year, there is something planned for just about everyone. Activities include a film screening about urban farming recycling events and contests and a special farmers market featuring educational tables and vendors. A "green" eggs and ham demonstration will provide a hands-on demonstration for graduating seniors about how to make a sustainable and nutritious omelet using farm eggs and local seasonal produce, while the annual Top Sustainable Chef competition challenges student chefs to prepare a dish using a secret ingredient. The building that recycles the most debris receives $3,000 worth of recycling equipment. Meet alumni, faculty and professionals from Emory and the Atlanta area and learn about the many facets of environment and development and how to become involved in the future. This event is open to all students, staff and faculty. Drop off electronic waste inside the lobby of Building A on the Briarcliff Campus. Exhibit by Emory students showcasing visual artworks that incorporate food. Come learn about Net Impact, a student group that uses business to create a more sustainable world. Contact Madison Poche at Madison.poche@emory.edu for details. Students, faculty and staff are encouraged to bring all non-Emory personal documents for confidential shredding to drop-off locations throughout campus. The annual student cooking competition uses a seasonal sustainable ingredient provided by Emory Dining. Join the Sustainable Food Committee and Volunteer Emory for a morning of hands-on volunteering at a local community garden. After the morning experience, the group will gather on campus for a provided lunch and discussion on the importance of sustainable urban agriculture. Contact Will Canon at Wcanon@emory.edu for details. The documentary highlights the emergence of urban farming in Detroit. The weekly market includes samples from Sparkman's Dairy. The meal features food grown or raised within 100 miles of Emory's campus. Patrons are encouraged to use ceramic plates instead of to-go ware. Sustainable and local food will be featured. A talk and booksigning by the Emory physics lecturer will include Brody's published short stories and his book "The Philodentrist Heresy." The event includes a Greeks Go Green-sponsored clothing swap on the Cox Hall Bridge. This is Part II of the annual student cooking competition using a seasonal sustainable ingredient provided by Emory Dining. The sustainable omelet cooking class is for graduating seniors only. Register with Julie Shaffer at Julie.shaffer@emory.edu. Register with Julie Shaffer at Julie.shaffer@emory.edu. For the complete listing and additional information, see the Earth Month 2012 calendar (PDF).